I’ve been reviewing a ton of iOS games recently, and I’m noticing one of the biggest elements that separates the mobile games I like from the ones I don’t. It simply boils down to how much I feel a game is rewarding me for the time I’m spending on it; the sense of progress it gives me, whether I’m for a few minutes or several hours. Abyss Attack is a game that plays pretty well, but makes me feel like the time spent playing it could be used in much better ways. It does very well with a genre that is potentially difficult to tackle on mobile devices, the vertically-scrolling schmup. 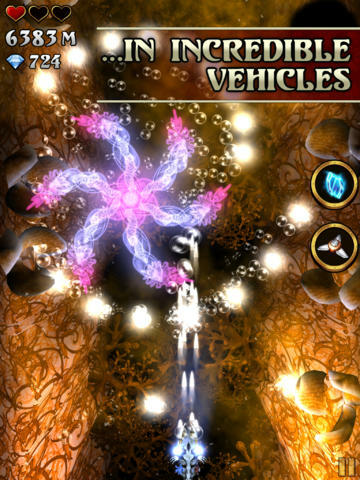 Adopting an underwater setting with slight hints of steampunk, Abyss Attack avoids the control issues that plague many a touch-screen game by making your vessel (a submarine) fire automatically and allowing you to control your vehicle by using pretty much anywhere on screen as an invisible virtual joystick. Every time you boot-up the game, you start from the very beginning, the idea being that you continually play the game to reach further distances of travel, as well as to collect diamonds to purchase upgrades and single use power-ups. All manner of enemies and bosses will occasionally get in your way, along with a few environmental hazards like flaming meteorites (I’m not sure how that works underwater, but there you go). Abyss Attack also follows the now-standard mobile gaming practice of giving you three sub-missions to complete, in order to level up and get access to more shop upgrades. It is my hope, that one day, app developers will move away from this overused mobile gaming trope, and at least try something different. 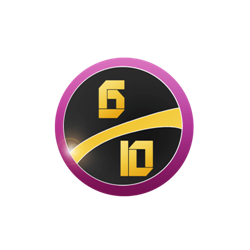 But for now, these sub-missions involve tasks such as defeating a certain boss, or using certain power-ups on a certain number of enemies. The problem is that is that the power-ups take too long to purchase and I never found them to be of any actual use in most situations. With only one life (unless you spend a certain amount of diamonds, starting at 350 and going up in number the more times you die in one game), you’ll be dying a lot and replaying the same early parts of the game an infuriating amount of times (though you could save up a bunch of diamonds and purchase some Boosts and Head Starts). As a result, what starts as a fun shoot-em-up ends up a repetitive and unrewarding slog. This is a real shame, as the core gameplay is solid and the graphics are pretty decent; the steampunk/underwater aesthetic is a unique one, and it makes for a very good-looking mobile game. The music is wonderfully trippy, going from energetic beats to chilled out moods, complimented by the bubbly sound effects. But none of this really makes up for the fact that, in the several hours I played Abyss Attack, not once did I truly feel I was making progress. I just kept playing the same areas over and over again, facing constant frustration as I realised that this game intends for you to either waste your time replaying those areas, or ultimately get fed up and spend some real money on those in-app purchases. Maybe if the purchasable upgrades, vessels and power-ups required less diamonds and less repetition, I would have thought more favourably of Deep Byte’s game. 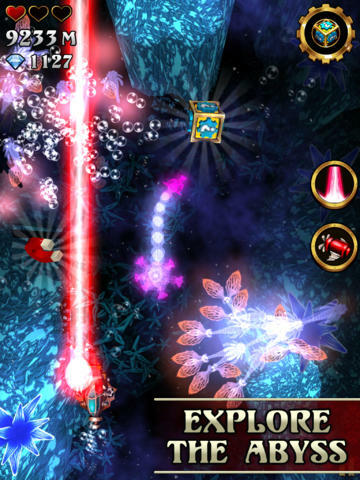 VERDICT: Abyss Attack is a solid vertical shoot ’em up that could have been a really good example of a mobile game. The controls are great and the setting, graphics and sound are unique, but this is also an example of what’s wrong with the IAP model: developers need to ensure that the player feels like their time investment is worthwhile. Only then will that player feel like they want to spend a little of their real money on in-app purchases. At the end of the day, it all comes full circle to my opening paragraph – I do not enjoy games that don’t respect my free time, and Abyss Attack certainly doesn’t.